Basically, I need to know if a random person on the street in Belgium would be as likely to speak Dutch as they are to speak French. Thank you! As I wrote in my first comment, the language spoken is highly linked to the place where you live, with a few mixed language areas, essentially in the Flanders part closest to Brussels, where the trend is an increase of French speakers. While being officially bilingual, Brussels-capital region itself is mostly French speaking, only ~7% exclusively speak Dutch at home. Precise numbers aren't available because it is forbidden by Belgian law to poll citizens about their native languages (just like ethnic or religious statistics are forbidden in France). All existing statistics are based on indirect measurements. It is estimated that between 40% and 43% of Belgium are native French speakers and native Dutch speakers are between 57% à 60%, and less than 1% native German speakers. Another issue is that even while someone might know the « other » language in addition to his native one, he might not show you it is the case and refuse to speak it. This is especially true for a minority of radical Flemish. I believe most Dutch speaking Belgians understand and are able to communicate in French but that less French speaking Belgians can do the same with Dutch, although almost all can understand and say basic sentences. In the German speaking area, almost everybody is bilingual German-French and very few issues exist, if any. Finally, if you wan't to avoid being involved in any linguistic trouble and you don't speak the official language of the area where you are, English is well known and spoken everywhere, usually better than in France. The Britannica says French speakers are 35-40% and Dutch 50-55%. This also corresponds more or less with Index Mundi, which gives these figures 40% and 60% respectively. More sources will help confirm these numbers. But anyhow, looks pretty even, but still a little more Dutch than French on average. Of course, these numbers are probably based on native language, not possible second languages. It may be, for example, that if all the French speakers have a passing command of Dutch then your chances of being understood in Dutch are much higher than in French. I like jlliagre's point that the question of location is probably more useful. 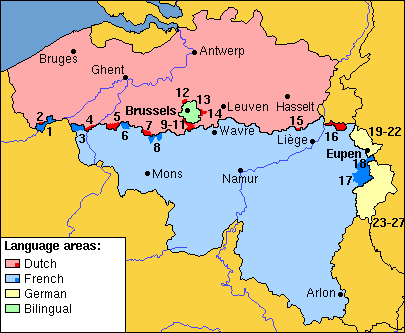 Wikipedia says that Brussels, for example, is 60% native speakers of French and less than 20% Dutch, and that's still very coarse-grained... this article may help identify particular municipalities' primary languages. Not the answer you're looking for? Browse other questions tagged belgique or ask your own question.